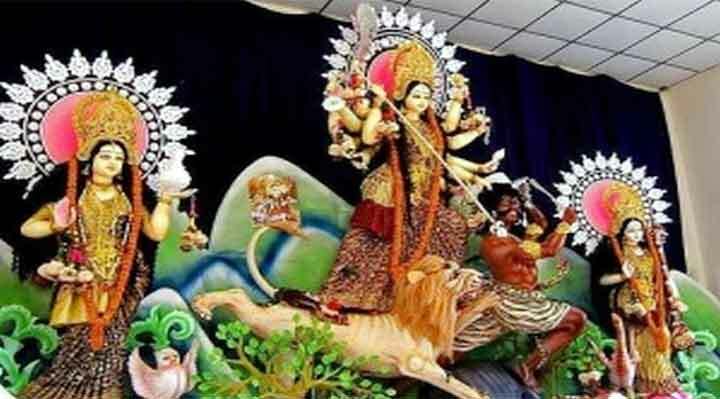 Dhaka, 15 October, Abnews: Durga Puja, the biggest religious festival of the Bangalee Hindu community, began today with the incarnation (Bodhon) of the Goddess Durga on the day of Maha Shashti at temples across the country. Shashti is the sixth day of Devi Pakhsha and marked the formal beginning of Durga Puja. Marking Shashti, Kalparambho was performed at 6.30 in the morning while Bodhan, (the incarnation of Ma Durga idol), Amantran (inviting the Goddess) and Adhiva (sanctifying the stay of the Goddess in the puja area of the pandals) were performed in the late afternoon. Recitation of verses from the Holy Chandi, blowing of conch shells and beating of dhak-dhols at temples and pandals started this morning which will continue for the five days. Maha Saptami puja will be performed tomorrow, Maha Ashtami, Kumari Puja and Sandhi Puja on Wednesday, Maha Nabami Puja on Thursday and Bijoya Dashami on Friday. President M Abdul Hamid and Prime Minister Sheikh Hasina conveyed greetings to the members of the Hindu community in separate messages on the occasion of the festival. A mood of festivities is being witnessed among the devotees irrespective of ages marking the festival while adequate security measures have already been taken in the puja pandals across the country. In Dhaka city, the largest number of crowd of devotees is expected to be seen in the five-day festival at Dhakeshwari National Temple, Ramkrishna Mission and Math, Kalabagan, Banani, Shakhari Bazar and Dhaka University Jagannath Hall puja mandaps. Security has been beefed up in all Puja pandals throughout the country, including the capital, with the deployment of additional squads of Ansars, police, RAB and other law enforcers for peaceful celebration of the festival. Besides, voluntary groups will also perform duties at the puja pandals.